It doesn’t matter if you are a professional woodworker or an ordinary “do-it-yourself” guy, table saw is a must-have for any workshop and anyone who likes to get things done by himself around the house. But there are several types of table saws and they cost anywhere from $200 to $3000, so finding the right one for your needs can be challenging and time consuming. But what if I told you that you are at the right place to discover ultimate in-depth reviews which will guide you to the best buy? We have made our lists of recommendations based on hundreds customer testimonials, pricing details, warranty, overall ratings and reviews, so you don’t have to. All of the product listed below are great buys, but most of it comes down to personal preference. If you want to check complete descriptions of some of the best products in this area, you can check them out in our reviews section, or you can go directly to customer testimonials. Before you rush with buying a brand new table saw for your workshop, you should ask yourself what type of it do you actually need. There are 4 types in general and all of them have unique features and usability. They are the most popular among DIYers and those who need portability. Unlike other types, they have lightweight aluminium tops, which are not as stable as heavy ones. They are designed to be carried around and they usually weight about 40 pounds, so anyone who is looking for a portable tool, benchtop saws are the way to go. They are ideal for any woodworker who often works on work site, and they don’t lack power despite their lighter and smaller motors. Pros: They are the most lightweight, portable and the most affordable out of all groups. Cons: Motors are not as durable and they are not as stable as other types. Most of them are also portable, but much heavier, and usually come with wheels attached. They have better induction motors, cast iron tables, and they are perfect for any heavy-duty work. Pros: Very cost-effective, more stable and powerful than benchwood type. Cons: They are heavier and larger than benchtop ones, and often not appropriate for moving around. DIYers are usually satisfied with power of benchtop saws, but if you have your own professional workshop, cabinet saws are easily your bestchoice. They feature induction motors with up to 6 horsepower, so they are powerful enough for any type of hard-duty woodwork. They are mostly made of iron and steel, so they provide the best stability. But because they are the most powerful, they also come with the highest price. Pros: Most powerful type of them all, they are more stable and durable than any other type. Cons: They simply can’t be moved around, so they are used in workshops only. Hybrid saws are designed to compete with cabinet ones, but for a more affordable price. They are appropriate for most kinds of heavy-duty work and they come with fully enclosed cabinets which help improving dust collection. With an average weight of 200+ pounds, they aren’t designed to be carried around. Pros: More affordable than cabinet ones, and they have improved dust collection system. Cons: Not portable and heavier than contractor type of saws. We made this list based on hundreds of customer testimonials throughout the internet, lists of features and price. We believe that all of the products listed below are great buys, but most of it comes down to personal preference. If you have your own favorite, let us know in comments section at the bottom of this page. Dewalt is one of the most successful brands in woodworking industry in the world. They have been around for almost 100 years and there almost isn’t a workshop in this world that doesn’t have at least one of their products. DW745 has received high ratings and many positive testimonials from thousands of woodworkers around the world. In fact, it has ratings of 4.6 out of 5, which makes it one of the highest rated portable table saws on Amazon. When it comes to portability, DW745 doesn’t fall short behind any other product in this price range. It comes with a foldable stand and only weights about 45 pounds, so carrying it around shouldn’t be a problem for any DIYer. 15 AMP high-torque motor is powerful enough and ideal for ripping through hardwoods. 10-inch blade reaches up to 3850 RPM and guarantees clean and precise cutting. It can be adjusted, so it can cut a maximum depth of 3-1/8 inches at 90 degrees. Dewalt offers 90-days full money back guarantee if for any reason you are not satisfied with performance of DW745. There are also 1-year free service contract and 3-year limited warranty available, and that is really saying something about quality and reputation of Dewalt as a company. and check the latest price and shipping details at Amazon! 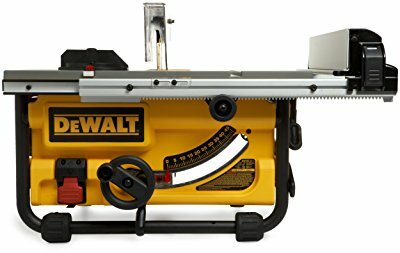 Compared to Dewalt company that was founded almost 100 years ago, SawStop has about 90 years less experience, but they are have a reputation for their innovative and advanced technology. Company was established in 2005 to sell saws with their patented safety system that stops the blade in just few milliseconds, if it gets in contact with any operator’s body part. PCS31230 is the highest rated cabinet saw on our list. One thing that really stands out, is SawStop’s patented safety technology, which has been incorporated in this model as well. It features an electronic sensor that detects when a person contacts the blade, and stops it completely with heavy-duty spring in just 1-5 milliseconds. System is so advanced that can easily prevent serious injuries to happen. Only bad part of this system is, that you need to change a blade and brake cartridge which costs less than $100. At the moment, PCS31230-TPG236 is the best rated cabinet table saw on Amazon with pure 5.0 rating. It’s not the most affordable product out there, but when it comes to safety and quality, you can be pretty sure SawStop PCS31230 is one of your ultimate choices. It currently comes with free shipping option, so you can have it delivered right in front of your doorstep with no extra costs. Bosch is one of the oldest companies with established reputation and trust. It was founded in Germany back in 1886, and there are not many houses in this world that don’t have at least one of their products. 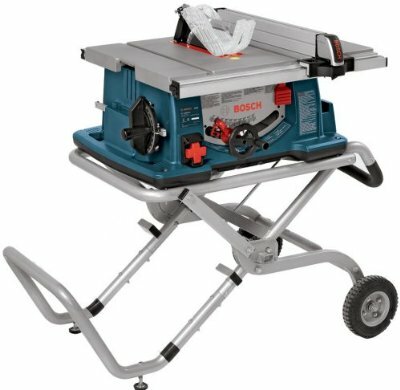 Bosch 4100-09 is one of the highest rated portable saws on our list. It comes with innovative portable construction with gravity-rise stand, which allows you to move it through the toughest terrains with ease. It features 15AMP motor with 4 horsepower which is powerful enough for any type of hardwoods. There is currently a massive 51% discount with free shipping available, which makes it one of the best buys in this area. 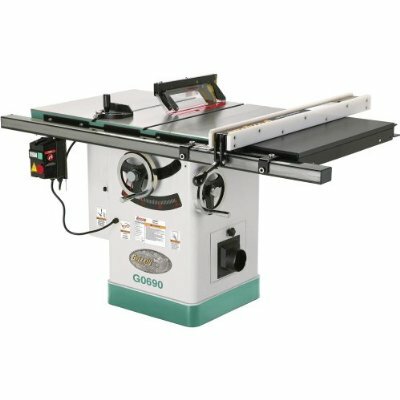 If you are looking for a cabinet table saw with great performance and superb quality, than Grizzly C0690 just might be the one for your needs. It has great positive testimonials and customer reviews throughout the internet and that’s the main reason why it managed to get on our list of recommendations. It is powered by 220V Leeson motor with 3 horsepower which is strong enough for cutting through all kinds of hardwoods. Most customers have praised its solid construction which is stable enough to satisfy even those woodworkers with highest demands. 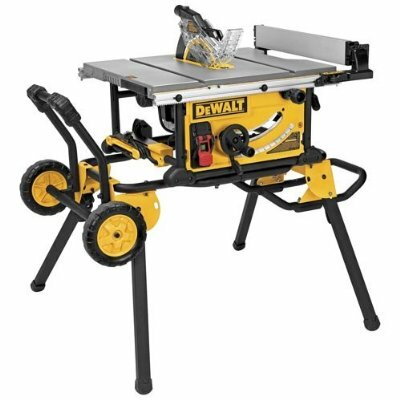 DWE7491RS is another benchtop table saw by Dewalt on our list. It currently has 4.6/5.0 ratings, and it would be inappropriate not to rank it on our list of top 5 recommended products. Like most top-end benchwood types of saws, DWE7491RS features 15AMP motor, which is powerful enough for ripping through hardwoods with ease. If you already owned one of the previous models from 740 and 750 series, 7491RS is upgraded and now offers 4800RPM no-load blade speed, improved and more functional rolling stand system, and larger dust collector. When you are buying any kind of tool for your workshop, you should always take some things into consideration. We have reviewed some of the best saws on the market, but before you make an ultimate choice, you should read our complete buyer’s guide down below. You can buy any $500 worth product for much less from unknown brands from China. But what sounds too good to be true, often probably is. Brands with no reputation don’t offer the longest warranty coverage and their products always malfunction after few months of use. Even if warranty covers all malfunctions, you have to send a table saw back and you can’t work with it until it gets fixed, which can take up to 1 month. If wood cutting season is at its peak, that means nothing but trouble. There are several types of table saws on the market, each one is designed for specific type of needs. They come in different size, weight, precision, power and capacity, so choosing the right one is very important. You can read more about them in the section above. It is estimated that there are almost 100000 saw-related injuries in USA every year, and more than 50% of them involved table saws. Safety should be always first and you should buy one with enough safety features. Of course you are never safe if you don’t handle tools with care, but modern safety systems are much safer than they used to be. 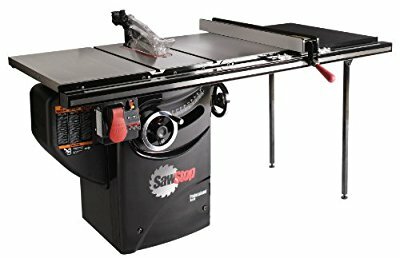 Table saws cost anywhere from $50 to $3000, but quality doesn’t come cheap. We have gathered some of the best offers available in our reviews section, so you can buy one for a discounted price and save some of your hard earned money. Electronics get broken sometimes and we can’t do much about it. When buying any tool for your workshop, you should always choose the one with decent warranty coverage compared to similar products. Most table saws come with 1-5 year warranty, so it’s on you to ask yourself how important is a warranty for you. Top-brands produce the most quality products, but it’s always good to know that you can be safe from any kind of malfunction during the first few years of use. Finding the right tool for your needs is often challenging and time consuming. Manufacturers always praise their own products, so you have to search for honest testimonials from customers that have actual experience with using different types of table saws. If you already own one, we encourage you to share your review with us in comments sections on our website. We aim to provide the ultimate buyer’s guide with latest information and discount offers to all of our readers who want to buy a new table saw, but they can’t decide which one to choose. However, it is nearly impossible to update our lists each and every day, but we will definitely do our best. If you have any question regarding our website, you are always welcome to send us an email through our contact form. We will try to reply in shortest time possible!